December 7, 2016 The Department of Fisheries and Oceans Canada recently released Aquatic Species at Risk Maps. Found out if there are Species at Risk in your cottage community on the Government of Canada’s website. Biological diversity or “biodiversity” describes the wide variety of animals and plants on the planet. Federal, provincial and territorial governments strive to protect and conserve biodiversity. Native species are evaluated that are taxonomically distinct. The Committee on the Status of Species at Risk in Ontario (COSSARO) protects biodiversity in the province. COSSARO is the Ontario Ministry of Natural Resources and Forestry (OMNRF) committee that evaluates the conservation status of native species and also provides advice and recommendations on the status of species at risk to the Minister of OMNRF under the Ontario Endangered Species Act (1971) and the more recent Endangered Species Act (2007). 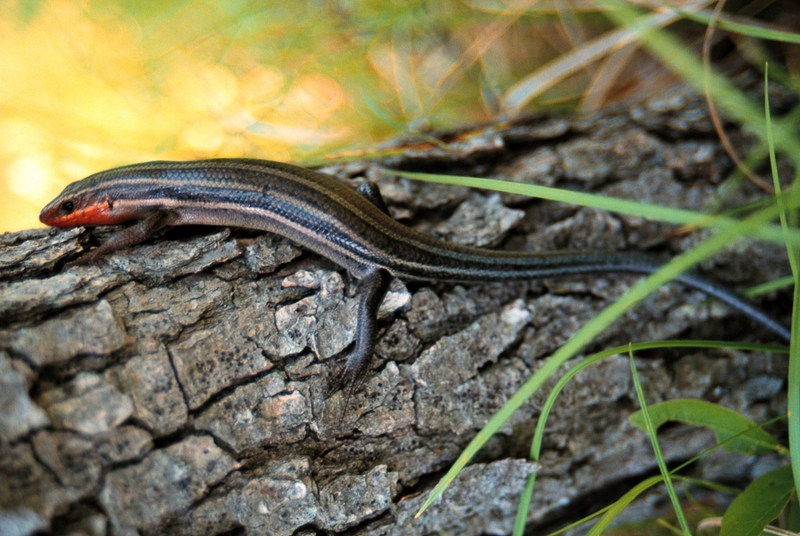 The five-lined skink is Ontario’s only native species of lizard. Image courtesy MNRF. COSSARO assesses species that may be declining on the basis of research by OMNRF biologists or from other reports. Additionally, COSSARO must assess species native to Ontario that have been assessed by the federal counterpart (COSEWIC). There are up to 12 apolitical members on the committee with scientific expertise or Aboriginal Traditional Knowledge (ATK). Meetings are typically held twice a year, but in 2014 COSSARO met in March, May and December. There is an Ontario National Heritage Information Centre (NHIC) that maintains a provincial database for provincial vertebrates and vascular plants and certain invertebrates (e.g., butterflies), and non-vascular plants (e.g., mosses). The NHIC ranks both global and provincial rarity. Federally, the Committee on the Status of Endangered Wildlife in Canada (COSEWIC) is a committee of experts from across Canada that assesses and reviews scientific information to determine if a wildlife animal or plant species is at risk. Species are evaluated on the basis of priority lists submitted by each of 10 Species Specialist Subcommittee (SSC) or by the ATK committee. COSEWIC meets twice a year for a week at the end of April and at the end of November. There are 31 apolitical voting members of COSEWIC, including one member from each of the provinces and territories (13); one member from each of Canadian Wildlife Service, Department of Fisheries & Oceans, Parks Canada, and the Canadian Museum of Nature; one Co-chair from each of the 10 SSC; one Co-chair from the ATK subcommittee; and, three non-government science members . Under the 2003 federal Species at Risk Act (SARA), COSEWIC serves as an advisory body to the government of Canada, and specifically to the Minister of the Environment. Extinct: a wildlife species that no longer exits. Extirpated: a wildlife species that no longer exists in the wild in Canada (or Ontario, if COSSARO), but exists elsewhere. Special Concern: a wildlife species that may become threatened or endangered because of a combination of biological characteristics and identified threats. Data Deficient: a category that applies when the available information is insufficient (a) to resolve a wildlife species’ eligibility for assessment or (b) to permit an assessment of the wildlife species’ risk of extinction. Not at Risk: a wildlife species that has been evaluated and found to be not at risk of extinction given current circumstances. Provinces and territories each have their own lists of species that are at risk of extinction. Often a species at risk within a province is also at risk throughout the country. However, there are cases where a wildlife species may be at risk in one province, but is more common in the rest of Canada or vice versa. Species at risk are reviewed periodically and their status may change based, in part, on identified threats. Of these six species, three (the bee, lichen and snail) have not yet been ranked in Ontario. The Black Redhorse is ranked as Threatened in both the province and in Canada. Whereas Warmouth is now ranked as Endangered in Canada, its present status in Ontario is Special Concern. Eastern Wolf, designated at Threatened in Canada, is Special Concern in the province.